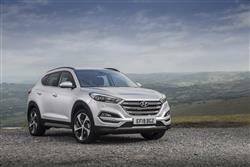 Find out everything you need to know on the new Hyundai Tucson from independent vehicle review website Car And Driving. You can watch the video review to the left to see more of the car or read their written review below to get a true insight from an expert in the automotive industry. Until the arrival of this Tucson model, Hyundai's idea of a Qashqai-style family Crossover model was encapsulated by its ix35. That car sold quite well but somehow, never quite captured the imagination of the buying public. The Tucson though, is a leaner, meaner-looking contender that might well catapult the Korean brand into credible contention in this important growing segment. Back in 2004, Hyundai launched what should have been a ground-breaking model. Three years before Nissan's Qashqai launched the buoyant market for family-sized Crossovers, the Tucson could have been that car. As it was, the Tucson was marketed as a small SUV, sold poorly and was eventually replaced in 2010 by a model the Korean brand did pitch as a family Crossover, the ix35. Now though, the Tucson name is back, this badge attached to a design that replaces that rather apologetic-looking ix35 and which brings a fresh sense of dynamism to Hyundai's presence in the Crossover sector. It'll need to do that for once you get beyond the lower range models, Tucson pricing is pitched a fair bit above that which applied to that ix35. Still, this is a much more appealing product, offered with and without 4WD and with a wide range of efficient petrol and diesel engines. Let's check it out. People have come to expect a lot when it comes to driving Crossover cars. Although they want a lofty perch, they also want to feel like they could be driving a hatchback. The Tucson delivers exactly this blend of virtues, hence its very road-biased suspension setup - and the overwhelming emphasis on two wheel drive models across the range. Most bases seem to be covered when it comes to engines, with a good selection of both petrols and diesels. At the lower end of the range, there's a choice of a 132PS 1.6 GDi petrol - or a 116PS CRDi 1.7 diesel that's uprated to 141PS if you order it with 7DCT auto transmission. Move a little higher and you can upgrade to a turbocharged 1.6 GDi petrol unit with 177PS. Diesel drivers in search of extra towing capacity and long distance pulling power will find a 2.0-litre CRDi unit offered with either 136PS or 185PS. If you want 4WD, then you'll need the turbo petrol or one of the 2.0-litre diesels. That 4WD system is fine for slippery surfaces but don't expect a great deal of mud plugging ability. As usual with Hyundai models, there's the option of varying the feel of the steering feedback, via different modes. It's in this area that Hyundai has arguably made the biggest step forward. With an imposing hexagonal grille and sleek Santa Fe-style headlights, the Tucson is a good looking Crossover. The wheelarches are pulled backwards which, along with the rising windowline and prominent creases in the flanks, adds some athleticism to the side profile. The overall look may not be as overt as you'd find with some rivals but you could never call it dull and the effect is especially nice with the 19" wheels fitted to Premium models. Climb aboard and the overall fit and finish is a big improvement on the ix35, with a well laid out (if unadventurous) dashboard with a hint of BMW X3 about it. If you find the interior a little dark, then there's the option of a cream lower half to the fascia which does brighten things up significantly. Mechanically, it's all very conventional which is no bad thing but does mean the Tucson can weigh in excess of 1500kg before you've even sat in the driver's seat. With 513-litres of seat up boot space available (or slightly less if you go for 4WD), the Tucson comfortably beats Nissan Qashqai and Renault Kadjar direct rivals. Fold the seats down and this capacity increases to 1503-litres (or 25-litres less for 4WD). Rear seat space is good, although the rear doors are a little on the small side. The range may start at less than £19,000 but it's very easy to spend an awful lot more. That price gets you entry level S trim with the non-turbo 1.6 petrol engine. Spend another £1,500 or so and you can opt for the 1.7 CRDi diesel. If you want the bigger diesel, then you'll need to look at 'SE Nav' trim at just over £24,000, with a further 4WD option adding nearly £2,000 more. If you want auto transmission or the higher output 185PS diesel and 177PS petrol engines, you'll have to pay for 4WD. All this means it's quite possible to spend well over £30,000 on your Tucson. Still, a rival Nissan Qashqai 4WD model could also top that figure with a few options added, so perhaps we shouldn't be too shocked. Even base 'S' trim comes with kit like a DAB digital radio and Bluetooth connectivity, plus USB and AUX connections, 16" alloy wheels, air conditioning and auto headlights. Next up is the 'SE' grade which adds 17" alloy wheels, rear parking sensors, heated front seats and dual zone climate control, plus the option of an 8" touchscreen sat nav system. Plush 'Premium' trim includes sat nav as standard, plus 19" alloy wheels, leather seats, front parking sensors, auto wipers and heated rear seats. Finally the top 'Premium SE' grade adds a heated wheel, keyless entry, a Smart Parking Assist System on autos, an electric tailgate, LED headlights, an opening panoramic glass roof and ventilated front seats. All models get six airbags, ABS with brake assist, traction and stability control. Plusher models gain a Lane Keep Assist System (LKAS), Rear Cross Traffic Alert Autonomous Emergency Braking (AEB) and Blind Spot Detection (BSD). The higher the model, the safer you'll be. The Tucson can't quite match some of its rivals when it comes to running costs. Still, carbon emissions are rated at a reasonable-sounding 119g/km if you opt for the 1.7 diesel. Go for the 2.0 136PS model and this creeps up slightly to 127g/km: add 4WD and you add 12g/km. The 185PS diesel offers a best of 154g/km thanks to standard 4WD, whilst the biggest sinner is the petrol turbo at 177g/km. Opt for the dual clutch gearbox however and this figure actually drops to 175g/km. As with the rest of the range, a 5 year unlimited mileage warranty is included with a 3 or 5 year fixed price servicing deal an option. So, what do we have? The tough looks of an SUV, the sensible practicality of a 5-seater mini-MPV and the affordability of a family hatchback. These are the facts behind a Tucson model good enough to attract many new buyers to the Hyundai brand. It's nicely built, efficient to run and quite capable in 4WD form of getting everywhere any ordinary family driver might want to go. No, it's not perfect - a class-leading family hatch might offer slightly sharper handling and better all-round visibility - but these aren't deal-breaking issues. More important will be this model's competitive pricing and lengthy warranty. It's a Hyundai of the modern era. And that makes it a very impressive car indeed.